Less than a week before the 137th Preakness it appeared there would be a full field for the fourth time during the past two decades – 14 horses going 1 3/16 miles at Pimlico. But, alas, then sixth place Derby finisher Liaison and ninth place runner Hansen bowed out. So did newcomers Hierro, Brimstone Island and Paynter. That leaves a field of 11. Twice the favorites in the second leg of the Triple Crown bounced back from defeats in the Kentucky Derby. Back in 1992, Pine Bluff, who finished off the board in the Derby, won the Preakness by three-quarters of a length. In ’05 Afleet Alex captured the Preakness by 4 ¾ lengths after finishing third at Churchill Downs to longshot Giacomo. Ironically, Giacomo finished third at Pimlico. Last year favored Animal Kingdom, the Derby winner, finished second to Preakness longshot Shackleford, who ran fourth in Louisville. This year Bodemeister, favored at Louisville but second to longshot I’Il Have Another, has a good chance of redeeming himself. 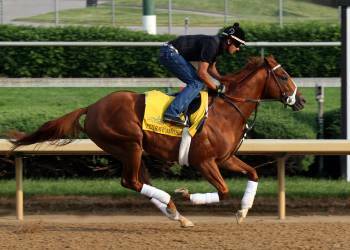 The number of Derby horses in the Preakness has averaged about five the past 25 years. That’s the number likely to go Saturday in the probable field of 11. First, I’m eliminating runners with only a single victory in their career: Cozzetti, a maiden winner last year; Optimizer, who hasn’t scored since his racing debut last August; and Teeth of the Dog, victorious only last February. I’m also discounting slower horses: Guyana Star Dweej, Pretension and Zetterholm. I’m also disregarding Tiger Walk because of his lackluster form: fourth in his last pair. Creative Cause made an eight wide run out of the Churchill Downs far turn to gain third in the stretch, but ended up fifth and hasn’t looked good in his last two chasing I’ll Have Another. Daddy Nose Best endured a horrible trip in the Derby right from the start after been forced in and steadied. Then the Sunland Derby winner made a good run to mid-stretch where he was bumped. A better trip should improve his 10th place finish and could put him in the money. Went the Day Well was traveling best of all in the Derby, making up more than eight lengths in the stretch to finish fourth. A good run will mean hitting the board and maybe even result in a victory. Bodemeister, with the lack of speed horses, most likely will go to the front. If he sets a sensible pace, he could go all the way. I’ll Have Another has proved to be a real gamer in his last two triumphs. Both times he looked rivals in the eye and disposed of them. He should do it again. I think we can agree only 5 have a shot. I’m not sue I like why you threw CC out of the mix. Wildcard of the bunch. Is this Mountie Jim Breslin?